Author: Sendler, U., Wawer, V.
PDM is gradually becoming a standard tool for industrial product development. But do all mean the same thing by PDM? Doesn't everyone see what potential lies in applying PDM? Are they exploiting that potential to the fullest? 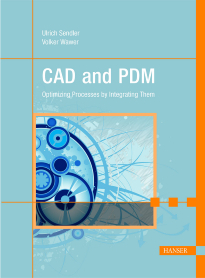 Integrating CAD and PDM, networking the engineering disciplines in mechatronics, supporting remote development environments, utilizing document management, linking PDM up with new technologies such as service oriented architectures—all of these are keys to optimizing the process of creating products. And the prerequisite for continuative strategies such as product life cycle management (PLM). Midsize industry has already assumed a leading role here, while large industry is largely hampered by internal departmental boundaries. This book makes a complex topic understandable and illustrates its line of argument with numerous concrete practical examples from user companies. The PDM System used as our main example is PRO.FILE by PROCAD. A practical aid for anyone directly or indirectly involved in development, design, production preparation, document management or the management of such company processes. This book covers topics such as creating projects, the graphical editor (GED), using navigators, creating reports, parts management, message management, revision management, exporting, importing, printing, data backup, master data editors and importing old EPLAN data. It also covers add-ons such as EPLAN Pro Panel and EPLAN Data Portal. The examples used in the book are available as an EPLAN Electric P8 project at www.eplan-efficient-engineering.com/handbook. Bernd Gischel works for Dressel GmbH & Co. KG in Unna as EPLAN administrator and designer for electrical engineering systems. He moderates the EPLAN forums at CAD.DE and EPLAN.DE and is responsible for the "P8 Magic" knowledge and data portal for EPLAN Electric P8.